Google it: Tangle Theatre’s three-man Marlowe gives Emily Holyoake a Faustian experience, she thinks. Doctor Faustus, The Bike Shed Theatre. Photo: Paul Blakemore. It takes five minutes of discussion with my sister after the show for her to discover that I didn’t even grasp the basics. I make a joke about how silly it is when Faustus conjures a bowl of grapes for a duke. She calmly points out this is to a) show that Faustus is petty enough to need to prove himself to important people, despite having literal powers of hell at his command, and b) show that Faustus is so mediocre he doesn’t actually know what to do with his literal hell powers. It is not just a joke about grapes. My ignorance is my own fault. There’s a complacency that I often settle into as a white, middle class audience member going to the theatre in Devon. Even if a play is totally new, the work is often being made by people like me, to be presented to people like me. The themes, designs, and performance styles are all contextualised for me, without me having to do any additional work. Tangle Theatre is South West England’s African-Caribbean theatre company, and their work combines aspects of both Southern African township and Western theatre traditions. A good proportion of the cultural reference points are not what I’m expecting from a production of Doctor Faustus therefore, and I’m confident some of it goes completely over my head (much like, apparently, some of the nuances in theme). Even though I think I know the story, the music, archetypes, and languages that Tangle Theatre weave into it create moments of overwhelming beauty and dissonance. The performances are assured, controlled, and rich. There’s a musicality throughout, most obviously in John Pfumojena’s choral compositions, but also in the crispness and clarity with which the three performers speak the verse. 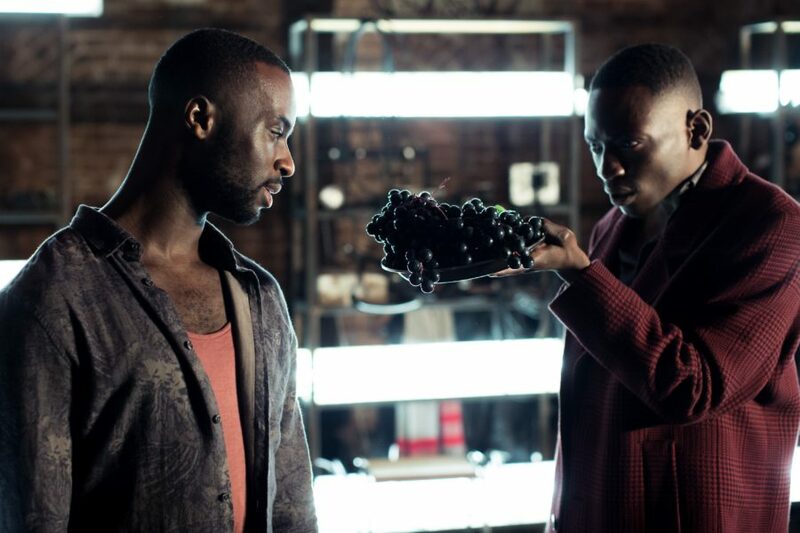 Joshua Liburd’s Faustus is a solid centre-point, and his egotism feels surprisingly gentle until the reality of his damnation starts to set in. Mogali Masuku delivers a cool, collected, and multi-faceted Mephastophilis, the kind of person you’d want as a friend if they weren’t also, y’know, a demon. And Munashe Chirisa’s humour and physicality light up every scene he’s in; by the end, the audience start laughing pre-emptively whenever he sidles onto the stage. It’s testament to how expertly this version has been cut and considered by director Anna Coombs that afterwards, it seems obvious that you’d only do Doctor Faustus with three performers. Why wouldn’t you? That’s all you need! Colin Falconer’s set is largely made up of three metal shelving units, decorated with various steam-punky oddities and practical lighting. It creates a mostly static playing space and gives the piece a solid core amidst Chirisa and Masuku’s myriad costume and character changes. The conjuring circle of fluorescent lights is simple and bold, but there are some other lighting moments that feel confusing or unintentional, like points where the lights cut out mid-scene but the characters keep talking. And I love a good floodlight jump-scare as much as the next person, but it gets a bit painful when those bright white lights stay on for a whole scene. On the other hand, there are moments that, like those bright lights, will be burned into my mind for a long time to come. Mephastophilis’ entrance is an absolute triumph; there’s a deliciously sacrilegious cameo by Chirisa before Masuku appears, winged, towering over Faustus, singing a climactic, angelic gloria. But it’s that otherworldly feeling of not quite understanding everything that I think will stay with me the longest. The feeling that I went in arrogant, and came out humbled. That is Faustian, by the way. I checked. Doctor Faustus is at The Bike Shed Theatre, Exeter, until February 24th, then on tour until March 17th. For more details, click here.